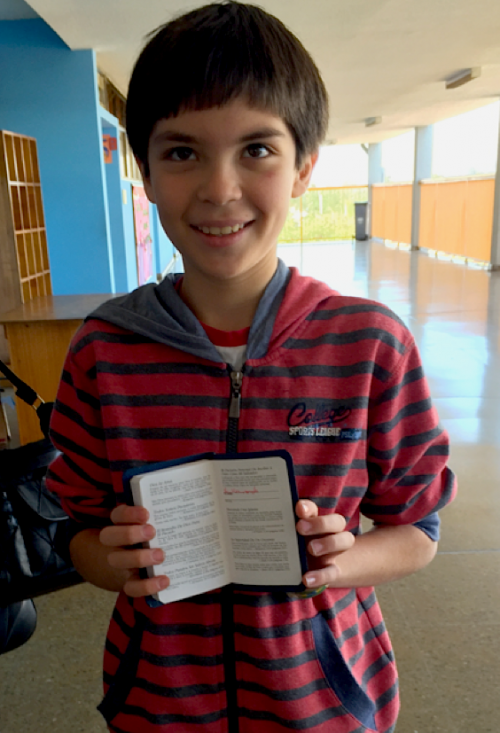 In April, Gideons conducted an International Scripture Blitz ((ISB) in Chile. Here is just one of the many testimonies already received from that blitz. I don’t really remember meeting Luis in class. We were speaking to many students that day, one class at a time. We finished the last eighth grade class just as the bell rang to dismiss the kids for break. As we made our way to the headmaster’s office, Luis came to introduce himself to me. The young student’s face was positively beaming. He could not speak English, I could not speak Spanish and my interpreter had already made his way into the headmaster’s office. Still we managed to communicate. He took out his New Testament and showed me where he signed his name in the back – indicating he too had made the most important and life-changing decision any person can ever make. Well done Ara. There certainly were a bunch of exciting stories just like this one from our Chile blitz that will live with many of us for the rest of our lives. PTL!! Amen! No language barrier in winning souls!